Hello everyone....today is the day we have all been waiting for....it's Release Day at Taylored Expressions!!!! Now all the fabulous goodies we have been showing you all week can be yours...you can fine everyting in the New section at the Taylored Expressions store!! My first project is a set of heart shaped Valentines...the cardbase for all the cards was cut with the previously released Heart Stacklets dies. The Little Bits - Bee die were used for the cute little bees, black pearls were used for the eyes, and the sentiment is from the new Punny Love set. The enamel heart and hemp cording were used to finish off the design. The sweet little fawn was cut with the Little Bits - Fawn die...it was sponged with brown ink and a black pearl was used for the eye. The sentiment layer was cut with a Heart Stacklets die andthe sentiment is from the Punny Love set...cording and enamel hearts are the finishing touches. Twirls and Swirls Embossing Folder was used on the silver heart in the background. The Little Bits - Love Confetti die was used for the heart and the sentiment is from Punny Love. 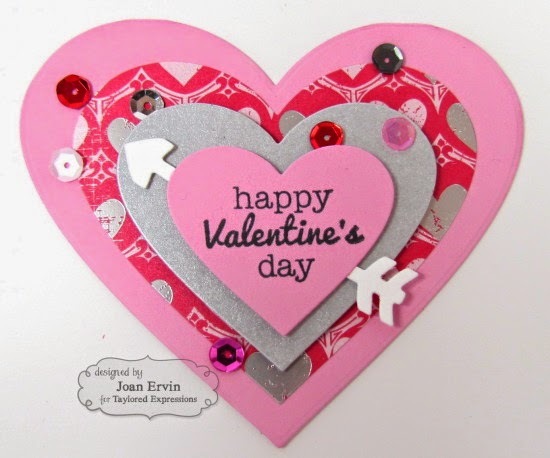 The heart layers on this Valentine were cut with Heart Stacklets and the arrow from the new Tag-a-Long Valentine dies was cut in half and adhered to the back of the top heart...the Punny Love sentiment and Formula for Love Matched Sequins completes the design. 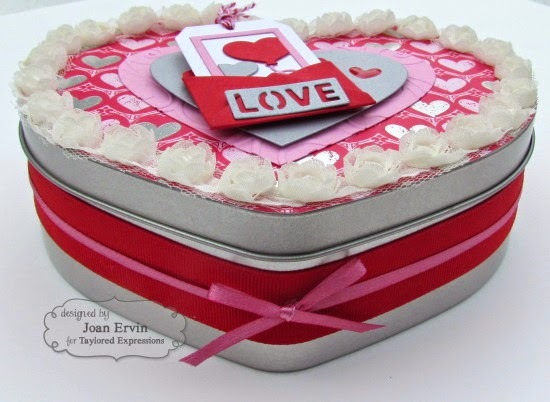 Since I love to make Valentines, I just had to decorate a heart tin that has been sitting in a drawer for years! The paper was adhered to the top and the flower ribbon border was adhered around the edge. The hearts were cutout with the Heart Stacklets and the bottom pink heart was embossed with the Twirls and Swirls Embossing Folder. 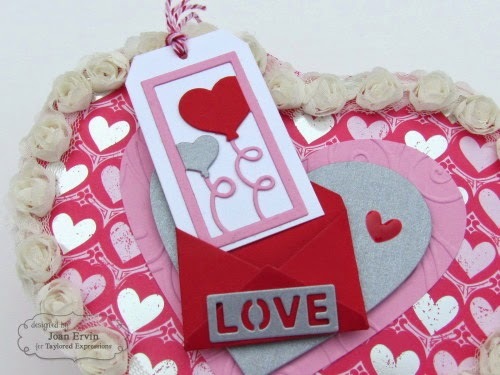 The Mini Envelope die was used to cutout the envie and the Love die from the Tag-a-Long Valentine was used for the silver sentiment. 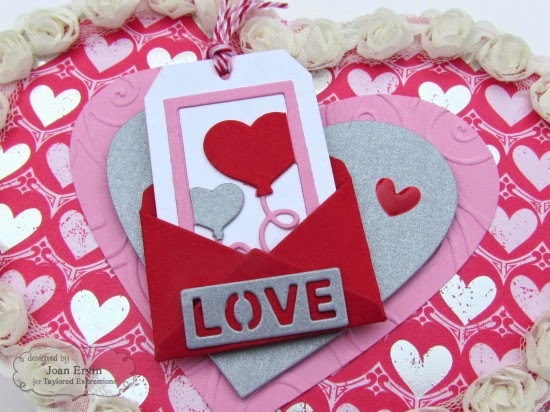 The tag was created with the previously released Tag Stacklets 2 dies and the You've Been Framed - Valentine dies. The ribbons, twine on the tag, and the enamel heart finish it off. 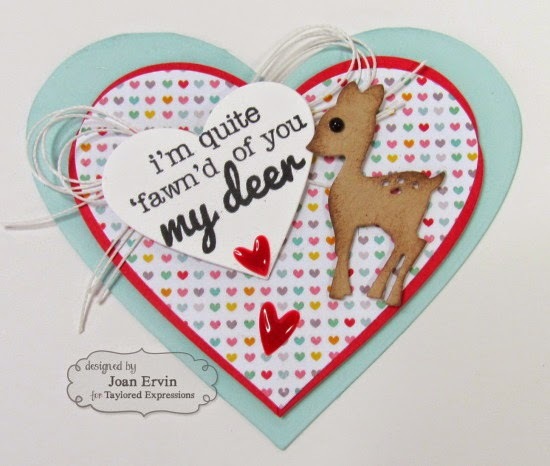 Thanks for joining us this week for the Taylored Expressions December Release week....I had sooo much fun working with all the super cute Valentine products!! If you'd like to see more new product information, please head over to the TE Blog for a complete blog roll of our participating designers! Oh, these are so sweet Joan. 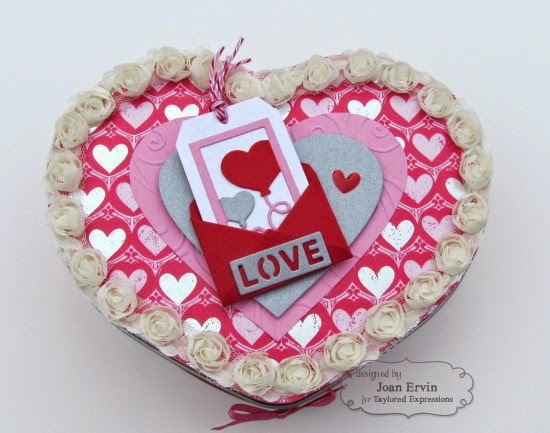 Love the heart shape and all the little die-cuts. I will have to get some of these for myself. These are so darling, Joan! 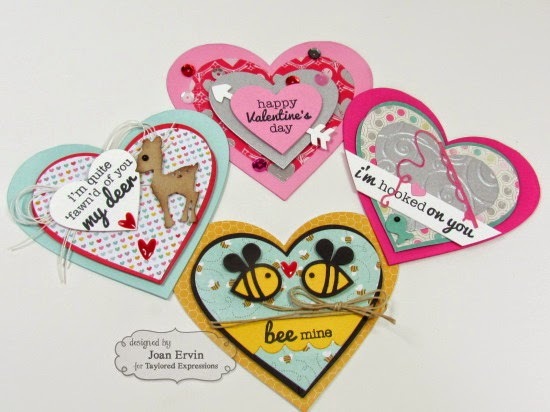 These are all so cute Joan! I love the sentiments that go along with the images. so cool.. 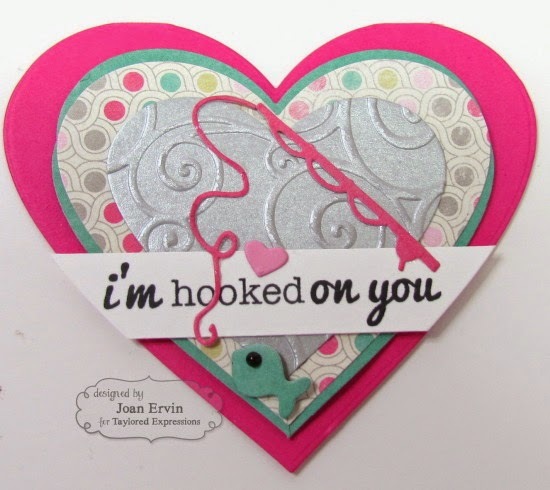 I love these awesome Valentines, Joan! Beautiful work!! These are SO cute! 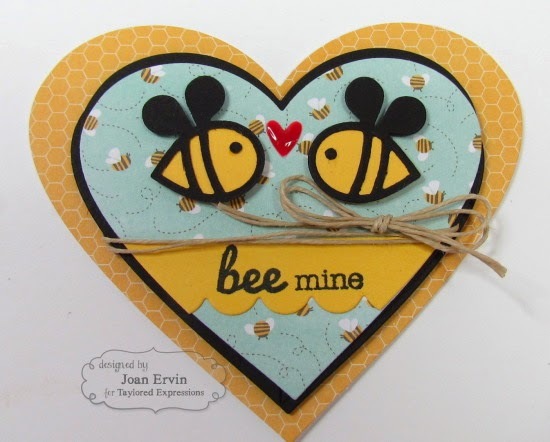 Awesome valentine projects!